, a very able lawyer of the seventeenth century, was the son of the preceding, and was born at Heidelberg, and probably educated there. He was, however, celebrated for his knowledge of the civil law, when Heidelberg was taken by count Tilly in 1622, and the university dissolved. This obliged him to leave the place, but he appears to have returned soon after, and to have endeavoured to support himself for some time by giving private lessons to the few pupils whom the siege had not driven away. In 1624, he published his " Exercitationes ad partem posteriorem Chiliados Antonii Fabri, de erroribus interpretum, et de interpretibus juris,' 7 fol. 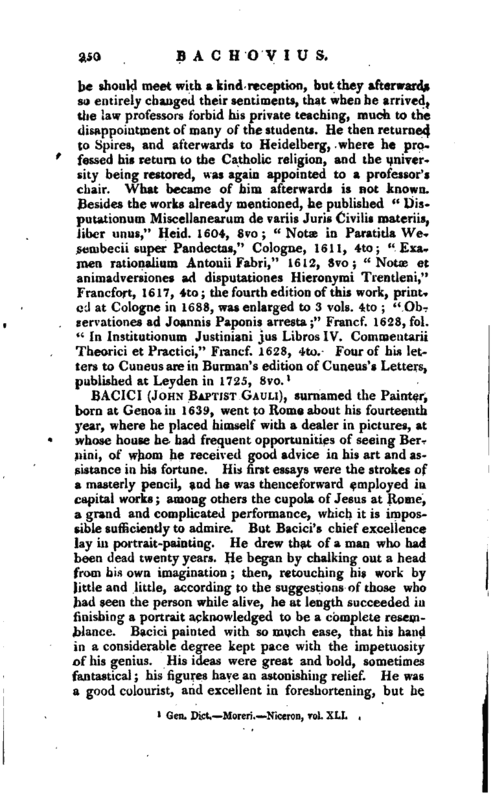 The same year he entered into a correspondence with the learned Cuueus of Leyden, to whom he communicated his intention of leaving Heidelberg, as the university, then about to be restored, was to be composed of catholics, while he was disposed towards the principles of the reformed religion. He intimated also to Cuneus that he had no higher ambition, should he come to Leyden, than to give private lessons. 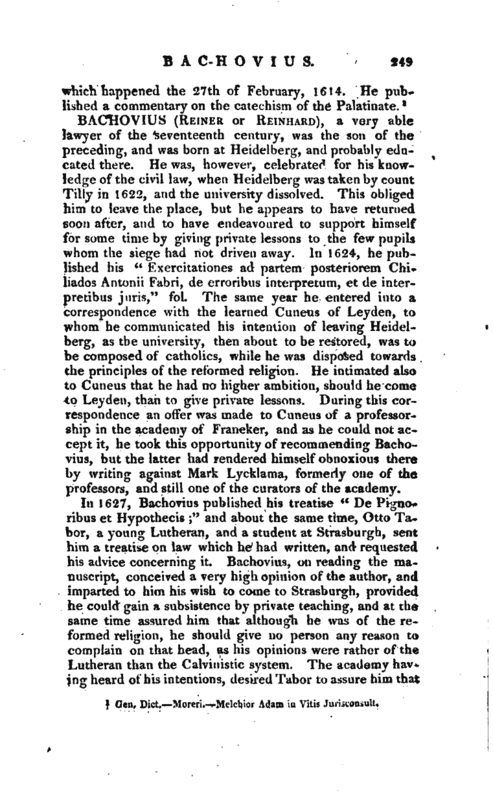 During this correspondence an offer was made to Cuneus of a professorship in the academy of Franeker, and as he could not accept it, he took this opportunity of recommending Bachovius, but the latter had rendered himself obnoxious there by writing against Mark Lycklama, formerly one of the professors, and still one of the curators of the academy.